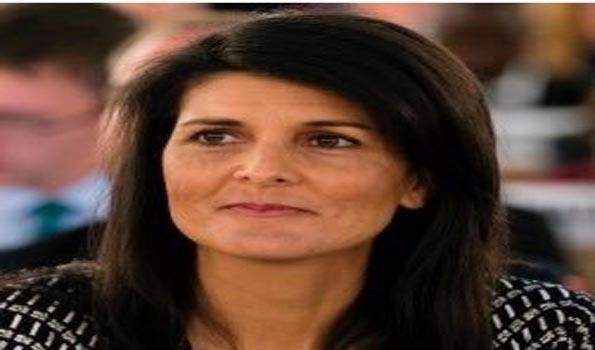 New York: In a direct attack to the Pakistan, US Ambassador to the United Nations (UN) Nikki Haley, on Monday, said the United States should not give 'even a dollar' to Pakistan as Islamabad continues to harbour terrorists. In an interview with 'The Atlnatic' magazine, Ms Haley said the US should not be given 'even a dollar' as it continues to harbour terrorists, who 'turn around and kill American soldiers'. "The one example I'll give you is, look at Pakistan. Giving them over a billion dollars, and they continue to harbor terrorists that turn around and kill our soldiers that's never okay. We shouldn't even give them a dollar until they correct it. Use the billion dollars. That's not a small amount of change. Tell them, You have to do these things before we will even start to help you with your military or start to help you on counterterrorism. It's those types of things that you really want to kind of look at," the US envoy said in the interview. Recently US President Donald Trump, in a television interview, had claimed that Pakistan does not do "a damn thing" for the US, he had also referred to the presence of Osama Bin Laden in Pakistan's Abbottabad. "you know, living... think of this... living in Pakistan, beautifully in Pakistan in what I guess they considered a nice mansion, I don't know, I've seen nicer... But living in Pakistan right next to the military academy, everybody in Pakistan knew he was there (sic)," Trump had said.